As you arrive at Bothfeet's tranquil, stylish and upmarket walking retreat a few kilometres off Victoria's iconic Great Ocean Road, you're greeted with a silent emblem. A pair of discarded hiking boots are positioned at the entrance to the lodge. But, far from being at the end of their use-by dates, each boot is metaphor for "Please change your mindset when you check-in". Spouting out of the boots are colourful blooms. The welcoming image encapsulates the essence of the Bothfeet experience. Individual. Quirky. Eco-friendly. Reinvigorating. Carefully targeted. And beautifully marketed. Of course everyone has heard of the Great Ocean Road, built in the great depression after World War I and now one of the world's most famous drives. However the Great Ocean Walk is a more recent invention, opening officially in January 2006. It's the youngest of Australia's Big Seven tourist walks, now being promoted as 'The Great Walks of Australia'. Tasmania's Cradle Mountain Lodge huts is 25 years old, while the same state's Bay of Fires Lodge Walk is celebrating its 21st birthday. Yet the Great Ocean Walk is not only the most accessible of the great walks to the majority of Australians and international visitors but, arguably, the least understood. Most people assume walkers simply follow the famous road, dodging traffic. In fact, for vast sections of its 250km length, the Great Ocean Road travels inland, out of sight of the ocean. So does the 100km Great Ocean Walk for that matter. But whereas the GOR from Apollo Bay to the Twelve Apostles could be sued under trades description legislation, the GOW is always within a few hundred metres of the cliff or beach. And - given the spectacular ocean views offered every half hour or so - the average walker is kept amazed and entertained by the huge diversity of wildlife and vegetation the undulating track takes you to as it winds though the Great Otway National Park . Bothfeet - set up in 2006 by Dana and Gavin Ronan, a husband and wife team who are industry veterans - offers a choice of four or seven day adventures (55km and the full 100km, respectively). You can also choose to join a guided group or walk independently with detailed notes provided by bothfeet. Our particular party of seasoned hacks would normally have taken the cheaper, self-guided option. After all, if you are walking east to west, as long as you keep the ocean on your left, you're unlikely to get lost. And yet Jane, bothfeet's guide, forces our party to do the one thing that ensures our group of five will never forget our walk together. She insists we slow down. She tells us to stop and smell the flowers. To be quiet so we can watch the echidna rolling and unrolling under the vegetation as it assesses the threat we pose. To be ready with the cameras to catch that flock of yellow tailed black cockatoos about to fly into the distance. Naturally, a walking holiday requires a certain level of moderate fitness. Yet the pace is gentle and there's plenty of stops - to watch a slow-moving echidna, have a cup of bush tea, enjoy the pre-packed lunch or simply admire the view. We're on the company's most popular option - the four day walk, from Castle Cove to the Twelve Apostles via such evocative names as Moonlight Head, The Gables Lookout and Wreck Beach. Each morning, we're ready for breakfast at 7am at lodge (a daily changing choice of something like eggs benedict or frittata along with fruits, home made mueslis and jams). While we eat, Jane briefs us about the day's walk. Then we fill our water bottles, select the treats we're taking with us from bowls of dried fruits, fresh fruits, lollies and trail mix. By 8.15am, we're boarding the lodge's bus for the short drive to the the day's starting point, which is also the point we finished the previous afternoon. Jane explains that a typical walking group consists of people aged from 40 through to 70 - though the oldest trekker so far was an 84 year old. Around 60 per cent of those who stay in the lodge choose to be guided. Obviously the walks are the highlight of the Bothfeet experience. Each of us has his or her own favourite sections. The two kms along beautiful, deserted Johanna Beach, scene of yet another shipwreck? The view from Moonlight Head? The stretch through a forest of stringybarks? But it's hard to go past the final morning from Princetown to the Twelve Apostles, getting ever-closer to a world-class icon without spotting a single other walker on the route. The bonus, for those who choose the guided tours, is to finish with a 10-minute helicopter ride over the Twelve Apostles Marine National Park - a fantastic snapshot of an ever-changing limestone coastline. And yet, the walking is only 50 per cent of the bothfeet adventure: indulgence makes up the other half. Every afternoon when we arrive back at the lodge we're treated to individual foot spas as we sip wine or beer and discuss our aches and pains. The lodge itself fulfills exacting eco criteria, but still manages to be sensuous and comfortable. The Ronans have used the footprint of the old cabin park that used to be on the site, but have transformed it - making the most of its secluded position surrounded by virgin bush. The heart of the operation is "The Wreck Room", which doubles as an airy communal lounge, formal dining area and bar. Magazines, daily newspapers and a club iPad are available from the nearby library. Don't expect TV or movies, however. Convivial conversation with new-made friends is the order of the day. The bedrooms are one the spartan side of stylish, though highly adaptable (allowing an ample King to be converted into two singles). But they're comfortable, private and part of the landscape: one of the joys is trying to identify the bird calls as you lie in bed. Nevertheless, banter continues unfettered until all those steps, the refreshing sea air and the prospect of an early start take their toll. By then it's almost...well, at least 9pm. 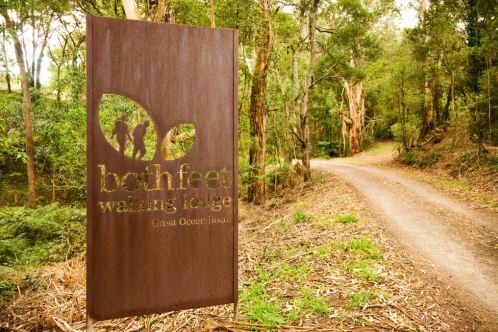 Check in: Bothfeet Walking Lodge, 70 Stafford Road, Johanna, Victoria 3238, Australia. Ultimate Luxury: Hire the entire lodge for your own walking party. Most Indulgent Moment: Individual foot path with drinks after the daily walk. Insider Secrets: If you haven't got any walking gear, most of it can be hired at the lodge. The Little Things: Home made trail mix and walking treats. Dress Code: Good boots and sensible walking clothes, plus smart casual for dinner. Dent in the platinum: 4 Day guided walk $1995 per person (self guided $1395); 7 Day guided walk $2995 per person (self guided $2095).